So the acquisition of the Star Wars franchise by Disney was a big deal and it lead to a continuation of the original trilogy of movies and a slew of spinoffs and side projects. I wasn't quite sure how to feel about this big push to expand the Star Wars "cinematic universe" or whatever, but then the early results have been quite rewarding. And then we come to this movie. Rogue One: A Star Wars Story is a movie set in the same universe but then is somehow not a direct Star Wars movie. And by that I mean that it's not a "numbered" movie in the overall sequence of the franchise. It's a standalone story that is not fated to become yet another trilogy of movies and that in itself is what helps to make this movie so great. And because of that it was also an opportunity to move away from the core cast of characters that have mostly defined the franchise since 1977. And thus it's not just a new part of the overall Star Wars story, but it's also a perspective that's fresh and different and not directly tied to the Skywalker family. 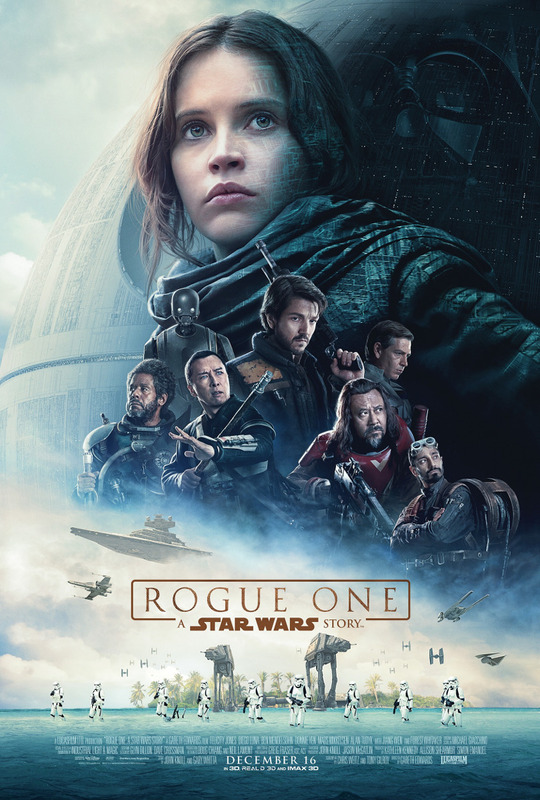 Synopsis: Rogue One: A Star Wars Story is a space opera movie directed by Gareth Edwards. The screenplay was written by John Knoll and Gary Whitta and takes place right before Star Wars: A New Hope. The movie begins with Galen Erso (Mads Mikkelsen) and his family realizing that the Empire has found them. Director Krennic (Ben Mendelsohn) demands that Galen return to the Empire to work on a superweapon project and they attempt to use his wife Lyra (Valene Kane) as leverage. In the end he is taken and his young daughter manages to hide until she is rescued by Saw Gerrera (Forest Whitaker). We fast-forward to the daughter, Jyn (Felicity Jones) now being more grown-up and also a criminal. The Rebel Alliance rescues her only to strike a deal. They hope to use Jyn to get to Saw Gerrera since news of an Imperial defector in his possession may hold word of the Empire's secret project. They also believe that her father is still alive and is also integral to the project somehow. She reluctantly agrees and travels with Cassian Andor (Diego Luna) and the reprogrammed Imperial enforcer droid K-2SO (Alan Tudyk). What I Liked: The movie has a really solid story with some great characters who all get their moments in the spotlight. As much as Jyn is our primary protagonist, in the end the story is about a team effort to find her father and ultimately to recover the plans for the infamous Death Star. And while we don't necessarily know a whole lot about every single member of the team by movie's end, we do know enough to be able to distinguish each from the other. But we also need to take a moment to talk about how perfect a lot of the special effects end up being. Sure, CGI Tarkin may have been a little creepy but he was still essential to the story and I'm glad that they found a way to bring him back into the movie. But what was greater was how they found a new way to depict the abilities of the Death Star and the big climatic battle at the end. And this is coming from a guy who used to rewatch the end of Episodes IV and VI over and over again just for the big fleet battle. The ending of Rogue One is a brilliant set piece that shows the best of space combat, ground combat and some infiltration action as well. And yes, I'm the camp that feels like K-2SO as the source of humor in the movie was perfect. It was crass and snide and it totally worked. And I'm onboard for Donnie Yen being the non-Jedi kickass martial artist character. What Could Have Been Better: There's still a lot of character development that could have happened of course but then the movie too long. We don't really know much about Cassian Andor apart from him being like a more exotic Han Solo and I don't quite get why Saw Gerrera had to have breathing problems and robotic legs. But that's life. TL;DR: You don't go watch a movie like Rogue One: A Star Wars Story to learn something new about the world or to examine the human condition. Instead you're watching the movie equivalent of a tabletop RPG one-shot session where everything is on the line and the player characters are ready to give everything they have in order to have a great story. And so the movie gets an awesome 5 great K-2SO one-liners out of a possible 5.